Enjoy western history, fun-filled family entertainment and outstanding outdoor recreation at some of middle America’s leading attractions and resort communities. The Missouri River takes in the eastward flowing Kansas River before it turns north. Missouri’s largest city is filled with history, and served as the embarkation point for upriver and overland travelers. A monumental bronze statue of Lewis, Clark, York, Sacagawea and her son Baptiste overlook the Missouri River at Clark’s Point in Case Park. The Alexander Majors Historic House and Museum on State Line Road is the home of the bold visionary who organized the Pony Express and Overland Stage routes. Kansas City’s Westport district was a primary trailhead for the Santa Fe, California and Oregon pioneer trails. Visitors today can enjoy a walking tour of the historic area that today houses unique restaurants, boutiques and hot nightspots. At the historic Westport district you’ll find Kelly’s Westport Inn, once owned by the grandson of Daniel Boone. Right beside Kelly’s is a building that was once owned by Jim Bridger. You can still get a cool one there. 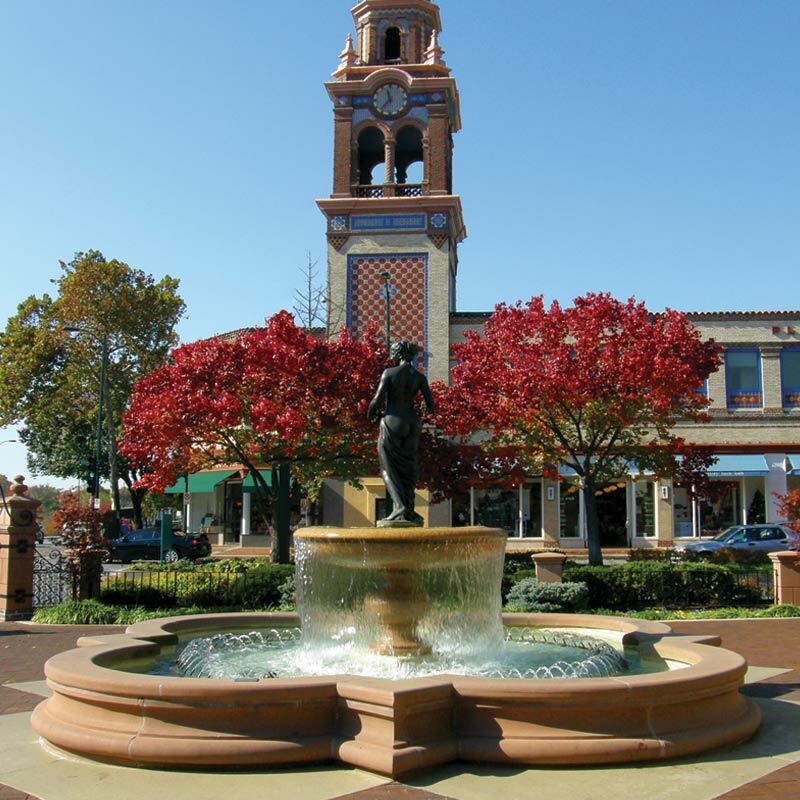 As the song goes, “Everything is up to date in Kansas City.” Visitors can enjoy and take in an array of cultural events and activities, including the ambiance of the Country Club Plaza, whose fountains, fine dining and shopping destinations are known far and wide. You can see memorable performances by the Kansas City Symphony and the Kansas City Repertory Theatre. You can also experience and enjoy the American Royal Horse Show and Rodeo, the Kansas City Royals, and the legendary showroom at the Blue Room in the American Jazz Museum. Priceless paintings, sculptures and historic artifacts are displayed at the Nelson-Atkins Museum of Art and at the Kemper Museum of Contemporary Art. Families and children can have a grand time at the Kansas City Zoo and the LEGOLAND Discovery Center, or they can ride on the wild side at the Worlds of Fun theme park. For those who like to make their money count, there’s the Money Museum with fun and interactive exhibits, and the good times are rolling across town at classic Kansas City barbecue establishments. 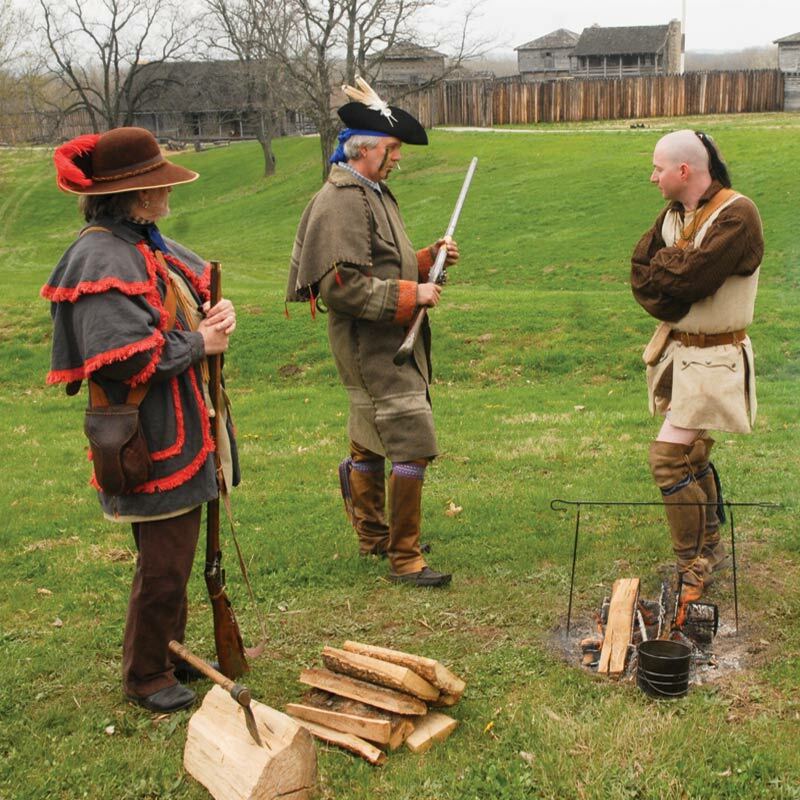 features the James A. Reed Memorial Wildlife Area, the Historic Longview Mansion, the Longview Lake Beach, County Park plus the re-created Missouri Town 1855 living history village which all provide great outdoor opportunities plus a chance to re-live Missouri’s early days. Early-day western Missouri settlements were the focal point of pre-Civil War border wars prior to and during the Civil War. Visitors can explore the remnants of a battlefield at the Battle of Lexington State Historic Site, where the Anderson House was used as a field hospital during the battle and still see a cannon ball in the wall of the county courthouse. The Confederate Memorial at Higginsville and the Burnt District Monument and the 1835 Sharps-Hopper log cabin at Harrisonville recall the turmoil that ruled the land. The Battle of Island Mound State Historic Site in Butler preserves the site where African American troops engaged in a Civil War battle. The St. Clair County Historical Society Museum at Osceola shows the destruction of the 1861 raid and burning of the city. The Bushwhacker Museum at Nevada features the stories of the Border War, Civil War and other regional history. President Harry Truman was born in Lemar in 1884. Guided tours of his family home are available. The Civil War Museum features exhibits on the Battle of Carthage while the Powers Museum of History has rotating exhibits and special programs on the area’s Post-Civil War and 20th Century history. Carthage offers a wonderful variety of historical sites and attractions that include Victorian architecture and unique galleries and boutiques. Adding to the area’s must see uniqueness is an original Route 66 Outdoor Drive-In Theater, the last original drive-in on the historic highway. Visitors can also see a mural that features many of the key sites on the highway, including the St. Louis skyline and Webb City’s Praying Hands statue. Five museums are featured in one museum complex that portrays the heritage of Southwest Missouri. 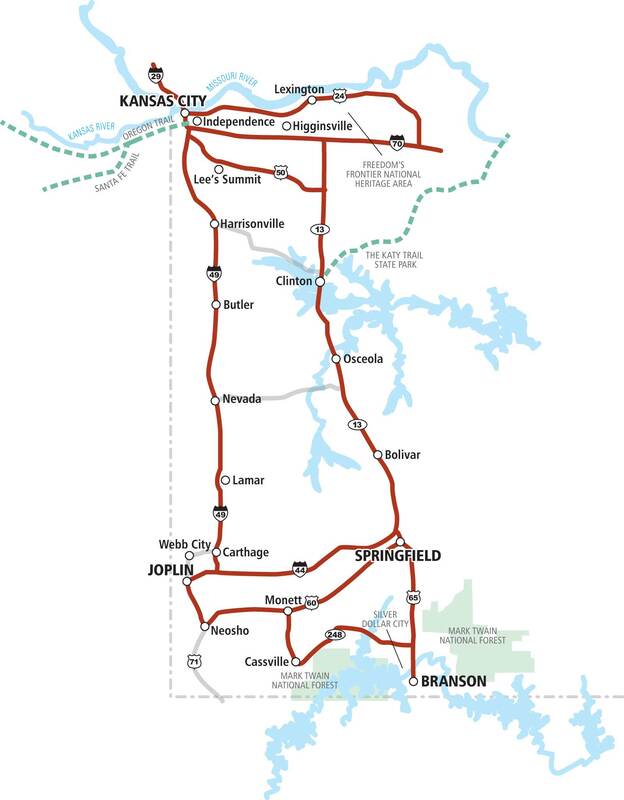 Visitors can also “Get their kicks on Route 66” at Joplin. Famous artist Thomas Hart Benton’s Joplin mural depicts the city in 1900. Great Falls, Missouri’s largest waterfall and the Wildlife Glades Conservation and Audubon Center are great outdoor getaway places. Neosho is home to the National Fish Hatchery which raises primarily rainbow trout and pallid sturgeon. The Fort Crowder Conservation Area, the site of “Camp Swampy” in the Beetle Baily Comic Strip features hunting, hiking, bicycling and a nature center. Roaring Rock State Park nestled in the Ozarks rugged and scenic terrain features trout fishing, swimming pool, hiking trails, camping, lodging, dining and a nature center. Called the “Entertainment Capital of the Midwest,” Branson offers great shows like Presley’s Country Jubilee and Dolly Parton’s Dixie Stampede. Or visitors can take a ride on the Branson Scenic Railway or experience first-hand what it is like to be aboard the Titanic on its fateful day. Visitors can ride the Branson Belle Steamboat on a two-hour cruise of Table Rock Lake. Brimming with parks, beaches and forests, Branson’s Ozark Mountain Country is a magnet for nature-loving enthusiasts. Near Branson is Silver Dollar City with great amusement park rides plus 100 Ozark craftsmen. Shepherd of the Hills near Table Rock Lake is a nightly outdoor show under the stars where the audience joins the cast in a lively square dance. On historic Route 66, Springfield features Fantastic Caverns which follow an ancient underground riverbed with large formations. It is the largest drive-through underground cave in America. The Dickerson Park Zoo, the Discovery Center, the Conservation Nature Center and the History Museum on the Square showcase the city’s diversity. Stockton State Park west of Bolivar is a favorite among boating enthusiasts. The park has a marina beach, lodging, picnic sites, campsites, hiking and mountain biking trails plus a water trail. The Burr Oak Conservation Center is a showplace for Missouri’s fish, forests and wildlife. The Harry S. Truman Library and Museum and the National Frontier Trails Museum are two of western Missouri’s most popular attractions. 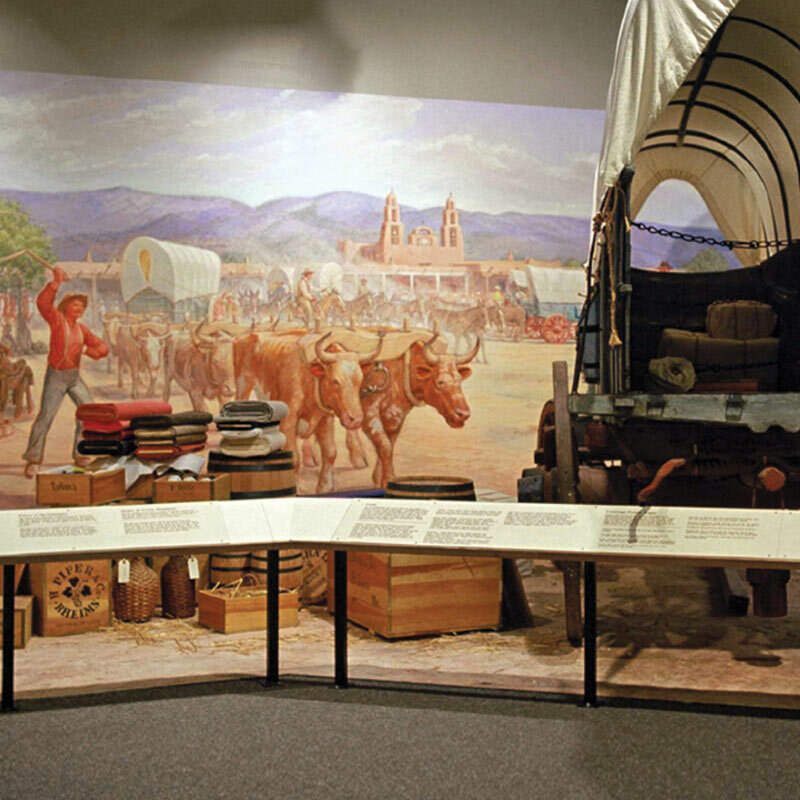 The Lewis and Clark, Santa Fe, Oregon, Mormon, and California Trails, as well as the first Transcontinental Railroad are all showcased at the National Frontier Trails Museum. Wagon trail ruts can still be seen near the museum. A Thomas Hart Benton mural in the Harry S. Truman Library and Museum depicts Independence and the opening of the American West, honoring the city’s trailblazing heritage.